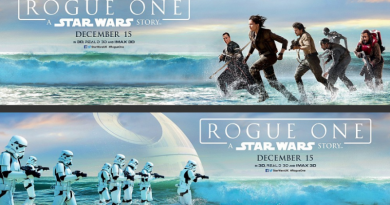 The Force Awakens marketing has been thrusters on full since our last edition on October 27, 2015. 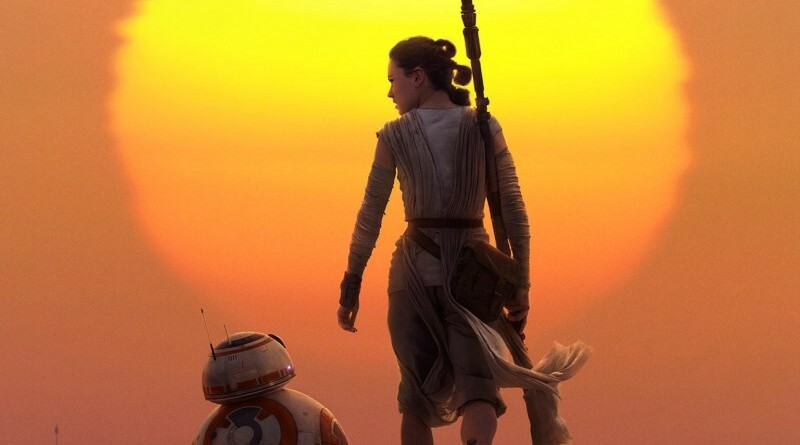 On October 31, FANgirl’s post “The Force Awakens Girl Power Marketing in Full Swing” covered the ramping up on a slow burn toward bringing more women into Star Wars’ orbit. The evening of Halloween revealed plenty of young ladies inspired by Daisy Ridley’s character Rey out in Force. On November 16th, Hot Topic launched their new line of higher end geek chic, similar to the Marvel line from earlier this year. 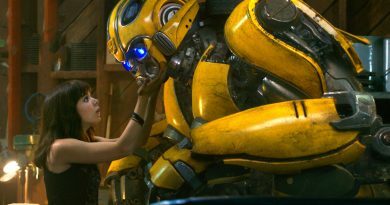 While the line isn’t exclusively tied into The Force Awakens, it does offer many new ways for women to express that Star Wars is for girls. Kessel Runway has been documenting the expansion of fangirl fashion, from Irregular Choice shoes to capsule collections at Matchless London and French Fashion Institute, which featured a Rey costume on display. The Wookiee Gunner recapped Star Wars at Malaysia Fashion Week and Toronto Fashion Week. Not all the featured looks modeled by Ridley are available yet. Here are a couple of my favorites. 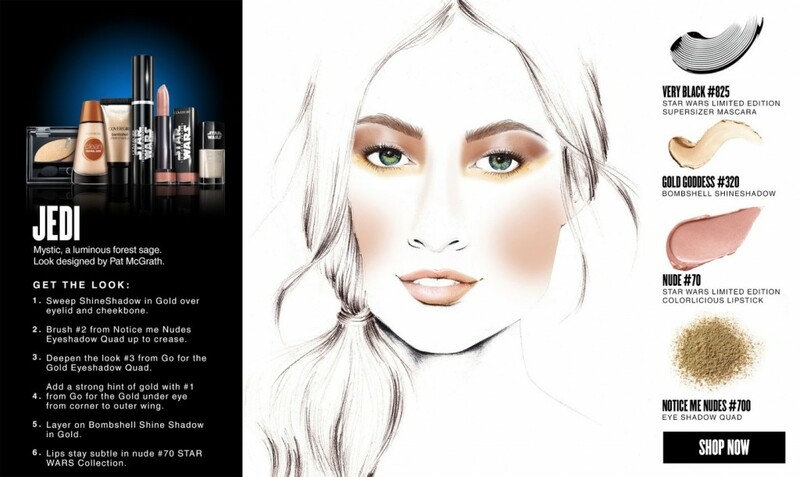 The CoverGirl Jedi look, which can be seen in ads in Entertainment Weekly and Elle, offers a more affordable alternative to Rey’s make-up. 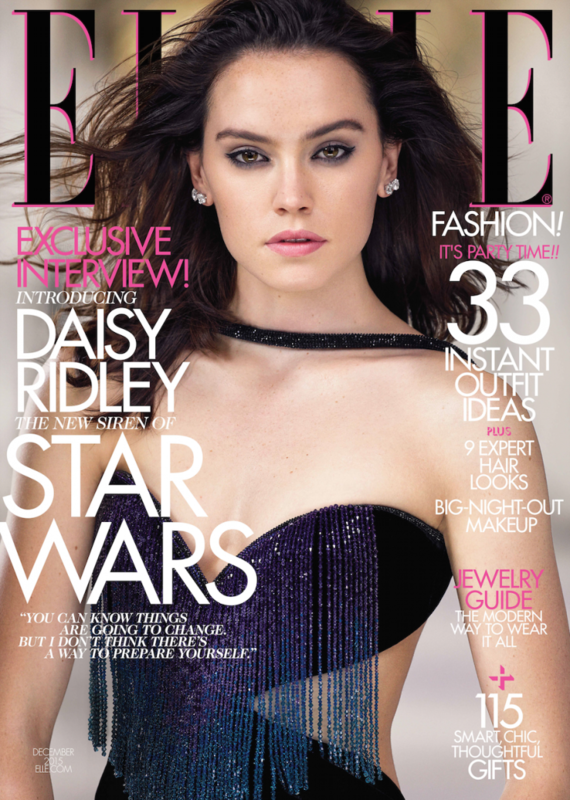 Daisy Ridley has been introduced to newsstands and grocery store check-out lines on the cover of Elle’s December issue. 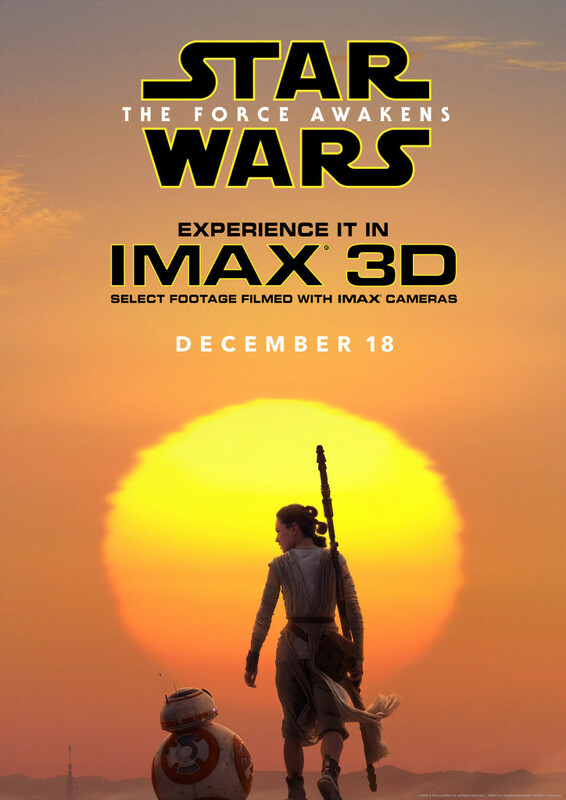 The Force Awakens is not only her first multizillion-dollar tentpole studio extravaganza: It’s her first movie. Ever. And with due respect to Princess Leia and Queen Amidala, this is no damsel role, nor is it that of supportive sidekick to the guys who are really driving the Millennium Falcon. If the rampant fan speculation on the hundreds of Reddit, StarWars.com, and TheForce.net message boards—along with the whispers out of Hollywood—is true, Ridley’s character, Rey, will be the first female protagonist in the series’ four-decade history. The print edition reveals this amazing ensemble featuring a haute couture tulle skirt paired with the stylist Simon Robbins own vintage t-shirt. The article uses quotes from Lucasfilm head Kathleen Kennedy, director J.J Abrams, and co-stars Harrison Ford and Carrie Fisher to frame the Ridley’s credibility to carry the lead. This is her first movie role, and the seasoned veterans feel they have found the right woman. In 2015, there was no scenario in which we weren’t going to bring balance to the way we tell these stories. And Daisy had a physicality and a self-confidence that was so important to the character we were looking for. She epitomizes that optimism where anything is possible. I wonder if it was this moment he was talking about? While Harrison Ford reminds Ridley of her dad – it’s the gold hoop earring – the veteran actor notes Ridley’s depth. I always thought the key to it was creating an emotional reality in context to some very weird and imaginative stuff. Daisy rightly understands that to be a part of the challenge, giving a sense of reality in a context where you have Chewbacca walking around. Carrie Fisher’s first impression was that Ridley was really shy, but eventually proved her wrong. It might have been in part due to the “Olympics” of acting Abrams says he put his cast through. How did Ridley feel about playing Rey? The Elle article creates a great centerpiece for the full fashion push to introduce Star Wars to an audience Lucasfilm hasn’t traditionally embraced in the past, leading more credence to there being a Girl Power angle to the overall marketing plan. Matilda. Oh my God, one of our camera guys worked on it, and I was bugging him all day. It almost felt like her journey is similar [to Rey’s] in that Matilda starts with so much she doesn’t really want to be and finds out something about herself that’s special. It’s that thing of a child or a young person or even an older person not feeling happy about what’s going on, feeling like there’s no way to change it, and then suddenly something happens and the possibilities seem endless. It’s about using what you have, what everyone has within them, all the special things about themselves, to make a good life for themselves and those around them. 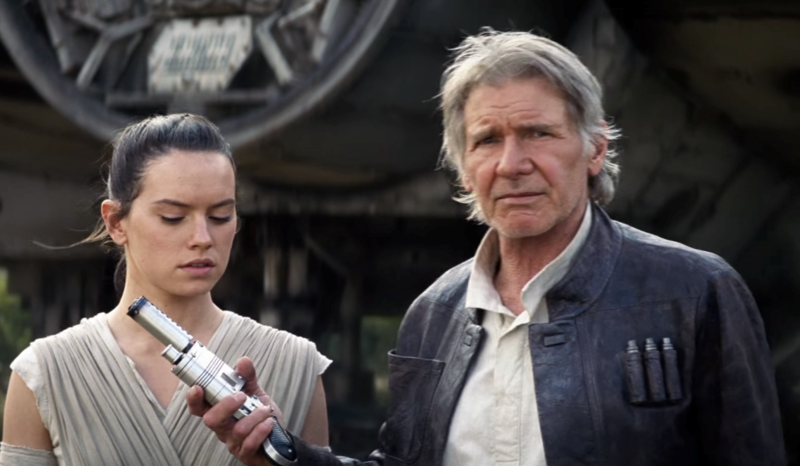 Boyega and Ridley confess to stealing Harrison Ford’s co-star golf cart. Their friendship is infectious and the press junkets should rival those of The Hunger Games with these two hamming it up. The One Day in Hollywood video gives an inside glimpse at the photoshoot for The Hollywood Reporter. In his Wired interview, director J.J. Abrams briefly touches on casting the movie and her interaction with co-star Harrison Ford. Entertainment Weekly dropped a Death Star sized load of information in their double issue, including several new images of Rey in their photo gallery. 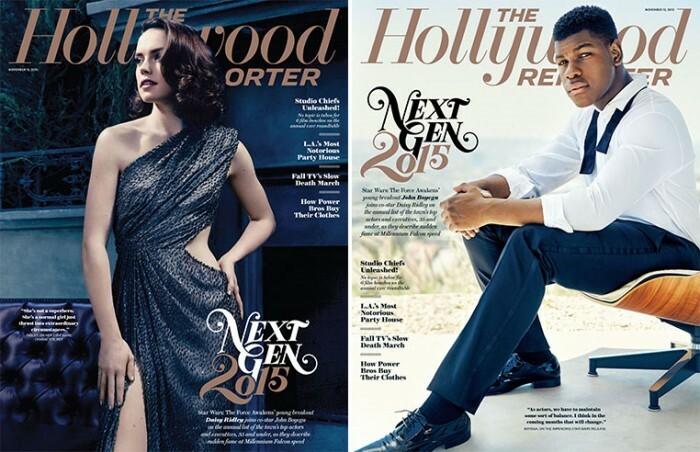 The piece on Daisy Ridley and John Boyega highlights how the young stars are changing Hollywood. Likely Rey, as the female lead in a Star Wars movie will help reinvent the way Hollywood thinks about what type of character can sit in the driver’s seat of a movie, but Ridley won’t have paved the way for female action leads in a genre mega-franchise. She has Jennifer Lawrence’s shoulders to stand on, and hopefully an ear to turn to for advice. Truly, though, Ridley’s own words in the EW piece suggest she is going to be just fine. Trailers, Footage, and So Much More! IGN gave us a glimpse of the beautiful theatrical banner featuring heroine Rey. But how about all that new footage we have seen the past week? The international trailer, subtitled in Japanese, isn’t quite the thing of beauty as the first official trailer, but it packs some story notes for non-American audiences, who don’t understand Star Wars as a movie genre. We see Rey doing more, in moments of shared danger and solo. Probably most striking shot is Kylo Ren bringing his blade to her neck, a visual that is reminiscent of samurai, and appears to be one of those intense, horrific moments that Abrams mentioned in the Elle piece. Season of the Force kicked off at Disneyland. 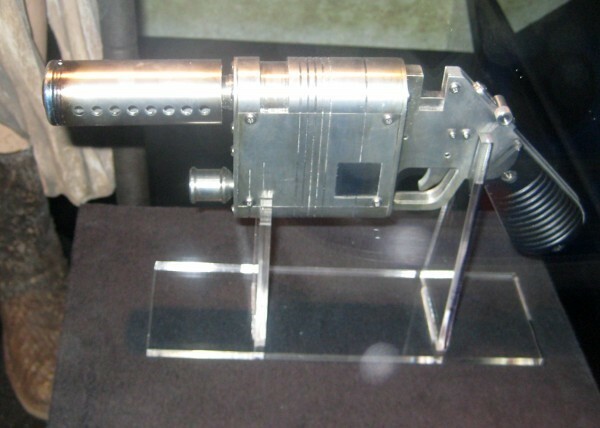 Collider has a picture of the blaster we see Han hand to Rey in the new trailers. It is on display with other movie props in Launch Bay. Speaking of guns, Ridley has been hard at work training for Episode VIII. 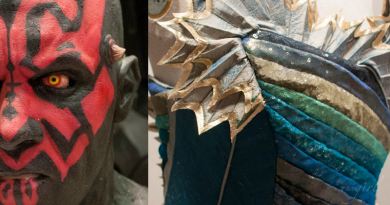 We’ll be back with more cosplay, fan art, and Daisy Ridley in the next roundup. Don’t forget, you can see Daisy Ridley on Jimmy Kimmel Live next Monday, November 23rd. For now, let’s close this post with the stunning IMAX poster. As of today, The Force Awakens is 30 DAYS AWAY! 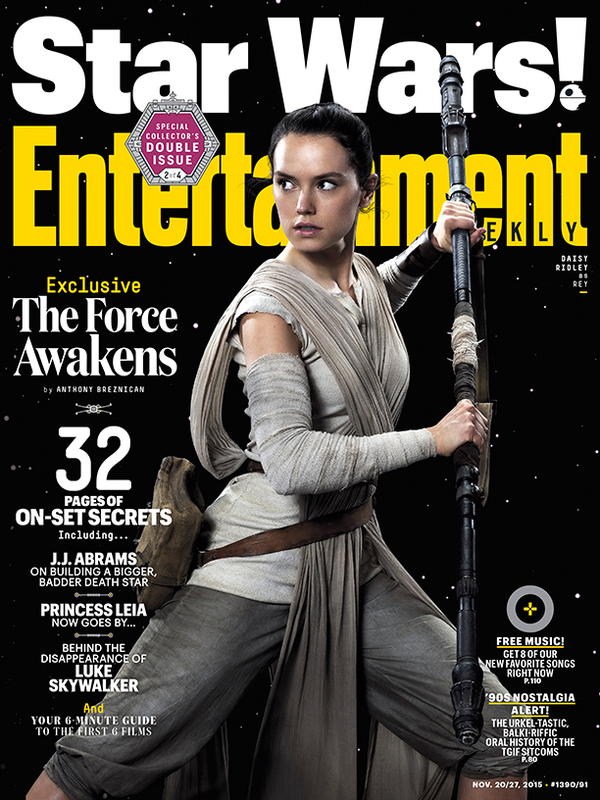 Here are all our Daisy Ridley Roundups in one place. 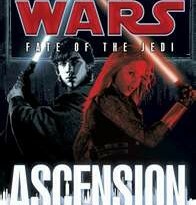 Do Franchises Need Traditional Publishing Houses?